Dividend Aristocrats – those companies that have improved their payouts annually for 50 years or more – have a mixed reputation. Sure, they’re great for dividend growth, but the likes of The Coca-Cola Co (NYSE:KO) and Procter & Gamble Co (NYSE:PG) give off the impression that price returns can be difficult to come by. But dividend growth and actual performance don’t have to be an either/or proposition. 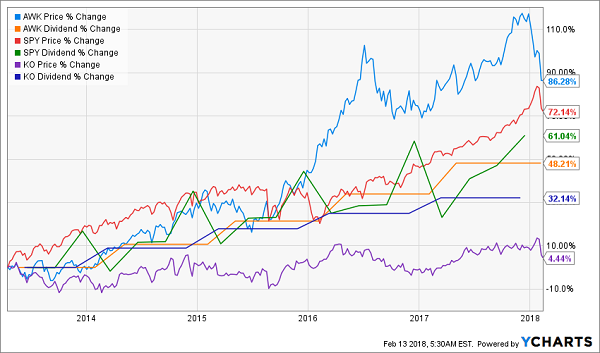 Today, I want to show you five dividend growth stocks that will prove just that. Why would any investor think poorly of the height of dividend nobility? After all, the ability to crank out more cash every year without interruption for half a century is a testament to not just a company’s market-share dominance and fiscal responsibility, but also the agility to survive and remain relevant across decades of market and economic shudders. Here’s why – Coca Cola’s payout (orange line) and price (blue line) have lagged the broader market by a wide margin of late! Coca-Cola is exactly what can happen within the ranks of the Dividend Aristocrats, and why membership in this “elite” group shouldn’t be considered an automatic seal of approval. Yes, Coca-Cola remains the most dominant brand in soda, with Diet Coke sitting at (a distant) No. 2. But KO also has found itself in the unenviable position of ruling a slowly dying area of the market, without the diversification of a PepsiCo, Inc. (NASDAQ:PEP), which also deals in snacks. As a result, both its shares and its dividend growth have lagged the broader market, as represented above by the SPDR S&P 500 ETF (NYSEARCA:SPY). Dover Corp (NYSE:DOV) boasts one of the oldest dividend increase streaks in the game at 62 consecutive years. But this veteran of the industrial space is hardly a sleepy play at this point – in fact, it trades just off all-time highs, and analysts expect the company will continue expanding in the years ahead. What doesn’t Dover do? The company’s business spans four divisions: Energy, Engineered Systems, Fluids, and Refrigeration & Food Equipment. Thus, its products range from pumps and sensors that allow for more efficient oil and gas extraction, to product ID solutions, to even systems that help turn solid waste into sustainable resources. Dover’s exposure to the automation industry makes it a prime candidate to benefit as more companies look to robotics and other solutions for efficiency. Transparency Market Research sees the global industrial automation market to jump from $182.6 billion in 2015 to $352 billion by the end of 2024 – a CAGR of 6.6%. I’m also curious to see what will come out of recent activist investor news, as Daniel Loeb’s Third Point hedge fund added a stake in DOV during the third quarter, calling for a spinoff of the company’s energy business. Doing so may unlock even more value from Dover’s shares. But if not, that’s fine too. Analysts expect average annual earnings growth of 15% for the next five years, which should both fund a growing dividend and help keep shares aloft. American Water Works Company Inc (NYSE:AWK) is a water and wastewater services provider that sports less than a decade of uninterrupted dividend growth. However, the company is celebrating 130 years of operation, and serves 15 million people across 47 states and Ontario, Canada – making it the largest publicly traded water utility in the country – so we don’t really need to question this company’s position as a market leader. But how is a utility company among the most exciting companies for the future? One merely needs to look at Cape Town, South Africa, which is projected to run out of fresh water by April, becoming the first major international city to suffer such a fate. But it may not be the last. Cities such as Bangalore and Beijing are among other cities that have true water scarcity problems – and before you assume this is a purely international problem, understand that Miami, Florida, has a saltwater intrusion issue that threatens its freshwater supplies. Companies such as American Water Works that both supply and treat water will become increasingly important in the years ahead. AWK has made itself a prime player via a steady stream of acquisitions that has expanded its reach throughout most of the country. 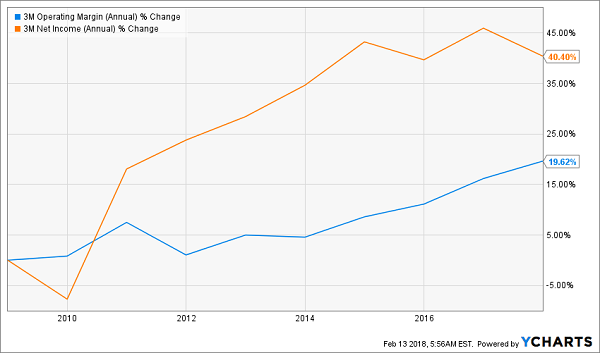 That in turn has made it an impressive investment over the past few years, outperforming the S&P 500 without even adding dividends to the equation. Looking forward, American Water Works projects 8% to 10% annual earnings-per-share growth through 2021. If that holds, AWK should be a tough-to-beat combination of stability and growth. American Water Works isn’t the only such opportunity among dividend growers, by the way. SJW Group (NYSE:SJW) and California Water Service Group (NYSE:CWT) are a pair of California-based plays that may be considerably smaller than AWK, but still have the potential to ride this trend higher – and boast 50-year dividend growth streaks to boot. Post-it note maker 3M Co (NYSE:MMM) might be one of my favorite Dividend Aristocrats if only because it’s just so diverse. Even a cursory glance at its products include a mouthful lineup that includes Ace wraps and supports, Command adhesive accessories, Ocelo sponges, Nexcare first-aid products, Scotch tapes and Scotch-Brite scouring pads. Its offerings span five divisions – Health Care, Safety & Graphics, Industrial, Electronics & Energy and Consumer – which means 3M not only has a diversified product lineup, but also a diversified portfolio of potential users. Translation: When one area is weak, several other divisions are there to pick up the slack. 3M, then, boasts exactly the kinds of products that should do well in any up economy, much like the one we find ourselves in now. 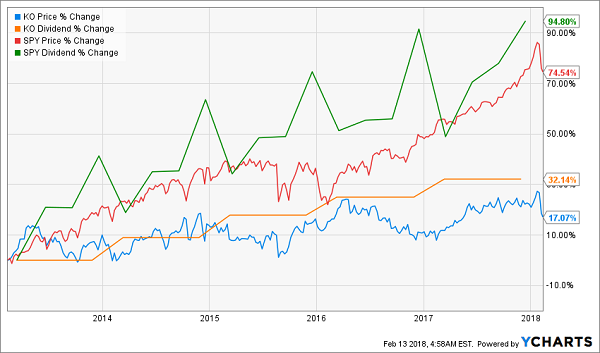 Analysts were already projecting nearly 7% top-line growth for 2018, filtering down to a 15% bump in earnings. Combine that with the potential extra business from President Donald Trump’s recently unveiled infrastructure plan – while 3M doesn’t exactly build bridges, it does provide many tools and products used by those who would rebuild America – and 3M could be looking at a nitro boost sometime in the next few years. 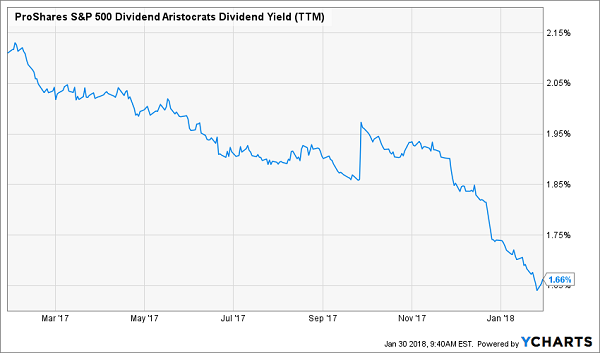 Dividend Aristocrats like 3M and Dover are impressive dividend growers, but a portfolio too reliant on Aristocrats will leave your retirement portfolio in haggard shape. In fact, with an average yield of less than 2%, the Aristocrats deliver less income than the 10-year T-note! However, I have a portfolio of dividend winners that not only will pay you 4x more, but will pay you 3x more often. 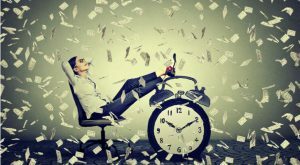 When you retire, chances are you’ll be relying heavily on dividend income to get you through your regular expenses: the house, the car, power … you name it. But while most publicly traded companies tend to pay dividends out quarterly, your bills sure aren’t quarterly. They come every single month, rain or shine. That’s why monthly dividend stocks make so much sense for long-term retirement planners. A reliable stream of income that doesn’t vary from month to month allows you to budget with precision. And with the right plan, you can collect $3,000-plus in dividends every single month – and do it with a smaller nest egg than even the suits at Merrill Lynch say you need to retire well. Monthly income to use against your monthly bills. Dividends large enough to allow you to live off investment income entirely. That means no selling your stocks and shrinking your nest egg, which ultimately shrinks your regular dividend paycheck. Better returns on any dividends you choose to reinvest. If you don’t need the income from your portfolio right away, you don’t have to wait every three months to put dividends to work – you can sink them back into new investments just about every 30 days! Article printed from InvestorPlace Media, https://investorplace.com/2018/02/5-dividend-growth-stocks-powered-unstoppable-megatrends-ggsyn/.